The North Shore rivers remain locked in their icy winter slumber. Spring is here do not be fooled! Chipmunks are scampering around and geese can be heard in the distance. 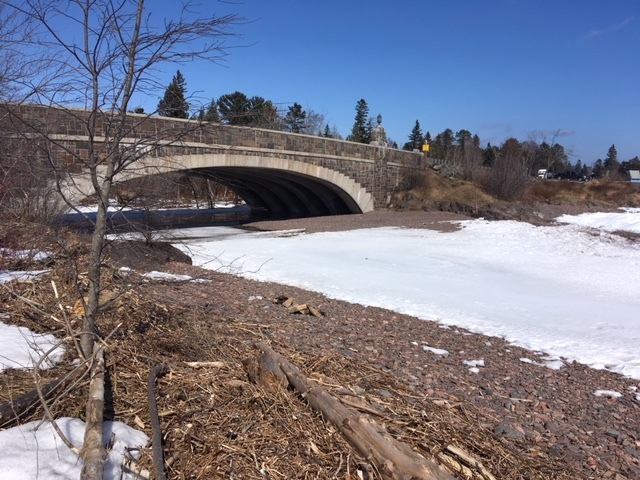 The Lester River was showing signs of thawing on Friday with water flowing underneath the ice formations but; cold temperatures have kept a tight hold on any hopes of a productive Spring melt. One could pass the time and cast off the shore or near the mouths of the rivers for Loopers. The South Shore is Rivers are open and in good shape for the opener this weekend but, water is low due to the lack of run off. If heading over to the Brule this weekend or towards Ashland area expect a lot of snow. Depending on how you look at it things are progressing along normally or behind. 🙂 Happy Fishing and Tight Lines.